The Curiosity Approach - Do aprons stop a child’s learning? 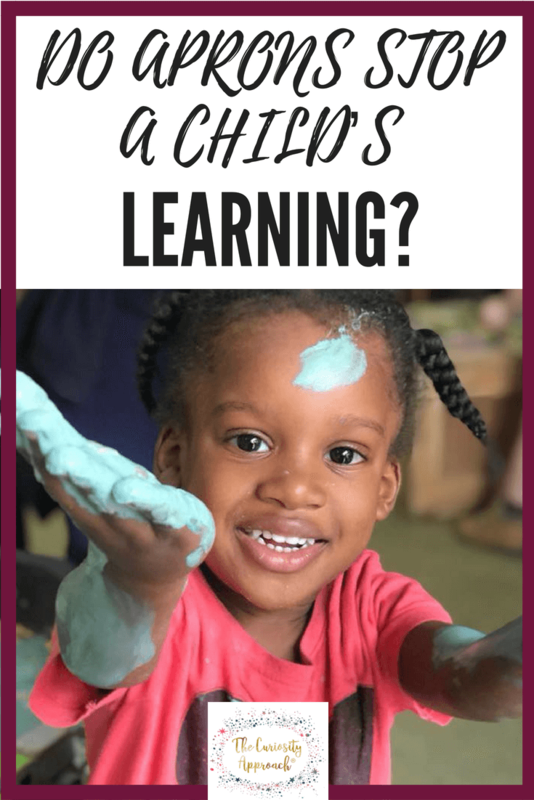 May 13, 2018 Do aprons stop a child’s learning? Sometimes it’s a struggle to get a child to wear an apron. Do some children refuse to wear an apron and therefore never engage in messy activities? When a child comes to a messy activity and starts to become engrossed with the resources. As educators, we might notice they haven’t got an apron on. What would you do and why would you do it? This little learner is totally engrossed in his play; deep level thinking is happening at this moment in time. He is curious about the marks made in the tray. Curious to investigate to find out what happens. It’s going to take ages to clean up!! The caretaker will go mad! The parents will go crazy about his clothes. 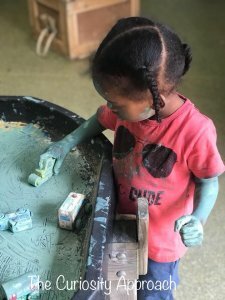 Some practitioners express concern at certain parents’ unwillingness to allow their child to explore freely materials such as paint. Therefore it’s important we work hard to resolve issues. 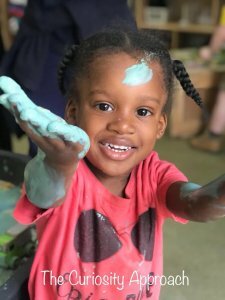 Hands-on workshops for parents and children are a great way of introducing parents to messy play and enabling them to experience at first hand the pleasure that children get from these materials and the possibilities for learning that occur. Imagine being a child turned away from an exciting activity because they have to stop now what they are doing to put on a stiff, plastic often wet paint-splattered apron! How will this impact the child? The child will walk away! The opportunity to be curious, discover, investigate LEARN, to have FUN, to become deeply engaged MISSED! What message are you telling a child? My clothes are more important than my learning, fun & enjoyment. Memory’s & learning opportunities last a lifetime. Let’s stand up for childhood play! Stand up to learning! Parents TRUST US to put their child at the forefront of EVERYTHING you do! Nowhere in your prospectus does it say clothes take priority over learning! Nowhere, does it say clothes take presidency over a child’s education? I KNOW parents want the VERY BEST for their children. I know as parents their MAIN aim is to see our children HAPPY, having extreme fun & ENJOYMENT. I know if ALL parents understood the IMPORTANCE of play & these messy activities. WOULD actively RETHINK the clothes which we are sending children to Nursery in. 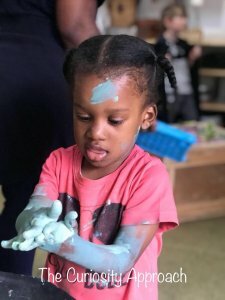 Let’s help our parents see the importance of messy play. Help encourage our parents to mindfully consider placing heaps of old ‘ play clothes ‘ in their bags! To send children to nursery in clothes that are not new or precious. Children can play and become deeply engaged without the worry of getting clothes dirty or ruined. I know if we all helped see beyond the mess, many more children would engage in WONDERFUL opportunities to learning as this one! Clothes wash! Education & memories last a lifetime!! Because we’ve always done it that way !